I first started routinely covering shale gas as a reporter for the Binghamton Press & Sun-Bulletin in early 2008. In my neck of the woods – the Southern Tier of New York -- the story came out of nowhere to become a routine fixture on the front page after a group of farmers in eastern Broome County landed a $110 million deal to lease land to a Texas drilling company. 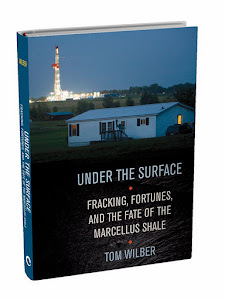 Thanks to pioneering efforts by members of the New York Farm Bureau and other land-owner advocates in New York and Pennsylvania, residents soon learned they were sitting over a vast resource called the Marcellus Shale, while global energy companies began vying for drilling rights to fallow land over tens of thousands of square miles. It was an irresistible and timeless story, with all the necessary journalistic elements: impact, prominence, lots of money and human drama. There were stories of rags to riches, dashed expectations, corporate exploitation, and policy conflicts dividing towns, cities and states. Soon after the $110 million deal in New York, the water well of a widow in northern Pennsylvania became saturated with methane and exploded. It was a portent of bad things and a major turning point in the story. The ensuing policy battle, driven over issues of water, waste, health and economic development, has produced two dynamically opposing scenarios -- full-on gas exploration in Pennsylvania, and a standstill just across the border in New York. And that’s where we stand heading into 2012. Everybody wants to know if this is the year drilling will begin in New York. We have heard much about the final release of the SGEIS -- Supplemental Generic Environmental Impact Statement – the state’s policy document, now undergoing its second revision, that sets the rules for permitting shale gas wells. One of the biggest take-aways from this thousand-plus pages of policy that's as dense as it’s name implies, is that tens of thousands of residents have actually plowed through it and offered comments for its improvement – and hundreds of thousands are familiar with its various permutations and significance. I see other factors, though, that will influence whether and when New York State will open its doors to the shale gas industry. The first is the price of natural gas. At around $4 per thousand cubic feet, it is less than half of what it was in the summer of 2008 when the shale gas bonanza began. Gas prices are driven by demand, which in turn is driven by the economy. Generally, the hotter the economy, the higher the price. The higher the price, the more incentive for the industry to aggressively pursue the resource and ramp up public relations and lobbying leverage. With prices where they are, and plenty of work do be done in Pennsylvania, the shale gas industry is at New York’s door and pounding, but it is not yet knocking it down. That brings us to the second factor: Politics. There are many political factors at play on a local and national level that will set the baseline for the level of resistance the industry will face. The EPA’s current study on the safety of fracking, due out in late 2012, is but one. Home Rule cases, organized by local governments who want to pre-empt state rules on drilling, represent another. These factors will most certainly be influenced by the dispositions of local and national leaders that will gain office after the 2012 elections. And then there is the big budget question mark in New York. As John Campbell of the Press & Sun-Bulletin reported today, there is no allowance in the state’s budget to hire the staff the DEC needs to oversee the industry. Without money for at least 140 new inspectors, don’t expect the state to begin issuing permits for shale gas development. New York budget battles…. Need I say more about uncertainties and political wild cards? These elements will interact in multiple ways, of course, creating countless scenarios that defy prediction. Three years after the farmers in Deposit became rich from gas leases and Norma Fiorentino’s water well exploded in Pennsylvania, the story has grown bigger than ever, and it carries plenty of momentum as it snowballs into the election year.